The 1990 Major League Baseball (MLB) Draft was held in June 1990. The draft placed amateur baseball players onto major league teams. 1,487 players were distributed to 26 teams. The draft consisted of first round selections, supplemental first round selections, compensation picks, and many more rounds, in fact, it went a record 101 rounds with 40 first round selections. With a league-worst record of 63 wins and 97 losses in the 1989 MLB Season, the Atlanta Braves selected short stop, Chipper Jones out of the Bolles School with the first pick of the draft. 9 NBA and NFL players were drafted in 1990. 7 of the first 10 picks were selected directly out of high school. Number 1 pick in the 1990 draft and MLB Hall of Fame member Chipper Jones. The following are the first-round picks in the 1990 Major League Baseball draft. The draft went a record 101 rounds, surpassing 1989's total of 88, and included a record 1,487 selections. The Astros had the most selections with a 100. Seattle followed second with 75, and then the Yankees with. The 1990 draft included two Class A clubs, the Erie Sailors of the New York–Penn League and the Miami Miracle of the Florida State League. Rule 4 draft regulations permitted minor league clubs to participate. Erie made one selection, 24-year-old Brigham Young outfielder Gary Daniels. Miami made 16 selections, signing 15 of them, including All-American outfielder Paul Carey of Stanford in the fourth round. 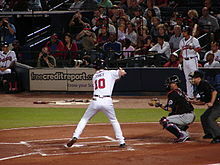 Atlanta made Chipper Jones, a high school shortstop from the Bolles School in Jacksonville, Florida, the draft's top pick. Detroit followed by picking outfielder Tony Clark out of Christian High School in El Cajon, California. The top three picks and seven of the top 10 choices were out of high school. In the weeks leading up to the draft, the Atlanta Braves, awarded the top selection after finishing with the league's worst record from the year before, had narrowed down their options and were still largely undecided on whom they would take. One name most frequently mentioned was Todd Van Poppel, a right-handed prep pitcher who could scrape triple-digits with his fastball. Van Poppel, however, adamantly stated that he would not sign with the club if they drafted him, and fell to 14th overall due to his massive signing bonus demands. The Braves instead chose a shortstop from Jacksonville's Bolles School named Chipper Jones, who would go on to be not just one of the greatest draft picks of all time, but one of the consensus greatest third basemen and switch-hitters in baseball history. Van Poppel, on the other hand, found very little success in the majors, and professional hitters exploited the lack of movement on his fastball and erratic command. Jones' endearing, easygoing Southern persona and remarkable consistency over his nearly 20-year career (all as a Brave) earned him a first ballot Hall of Fame selection. ^ "MLB Draft 2017 Results - Baseball America". www.baseballamerica.com. Retrieved 2018-02-07. ^ "1990 Major League Baseball Standings & Expanded Standings | Baseball-Reference.com". Baseball-Reference.com. Retrieved 2018-02-07. ^ "MLB First Round Draft picks - 1990". Retrieved 2008-07-25. ^ "Background on the 1990 MLB Draft". Archived from the original on 21 June 2008. Retrieved 2008-07-25. This page was last edited on 9 February 2019, at 13:32 (UTC).